The Winter Gardens at Blackpool once again played host to the annual Provincial Grand Lodge meeting and once more demonstrated that it is an excellent venue in which to stage this visually impressive event. The vast stage of the Opera House was transformed into the ‘lodge room’ with furnishings kindly loaned from Blackpool Masonic Hall. Surmounting the stage was the giant banner promoting the MCF 2021 Festival which had made its inaugural debut at last year’s meeting. The stage is set, surmounted by the MCF 2021 Festival banner. This year’s event was hosted by the Leyland Group and almost 1,200 registrations ensured that the stewards had plenty to keep them busy. The West Lancashire Freemasons’ Charity once again generously sponsored the provision of PSA tests for anyone who wished to avail themselves of the opportunity and there was a steady stream of ‘customers’ from early morning onwards at their location in the main atrium. The afternoon’s proceedings began with the entry procession of the Provincial Grand Master Tony Harrison, accompanied by his deputy, assistants and the whole Provincial team, into the auditorium and up onto the stage. With the stage so grandly ‘set’, once the lodge was opened, the first item of business was to honour departed merit by remembering those who had sadly passed on since the last meeting. Tony then turned to the glittering array of distinguished visitors who formed an impressive sight on his left and extended a very warm welcome to no less than six visiting PrGM’s and officers from other Provinces as widely spread geographically as Northumberland in the north to Cornwall in the south. Also attending were leaders of several other Masonic Orders. All were given a very loud and enthusiastic welcome by the audience in true West Lancashire fashion. Following the reappointment of Philip Gunning as Deputy Provincial Grand Master, Tony then said: “Today, three of my APrGM’s retire from office. I refer to Tony Bent, Harry Cox and Robert Wright, who between them have given 55 years of loyal service in high office. I thank all three of you personally and on behalf of the Province and wish you all a, long, happy and healthy retirement.” He then reappointed and thanked the remaining APrGM’s, namely David Winder, Derek Parkinson, David Grainger, Kevin Poynton, Stewart Seddon and David Walmsley. The PrGDC was then asked to form a deputation and place the three candidates for investment as the succeeding APrGM’s before Tony. In due manner, David Randerson, David Ogden and Frank Umbers were formally obligated and invested as Assistant Provincial Grand Master’s and saluted by the assembly. 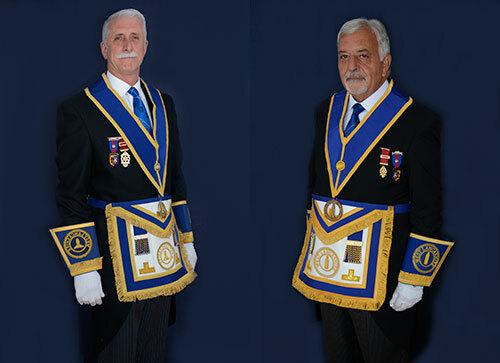 The three, newly appointed APrGM’s, pictured from left to right, are: David Ogden, David Randerson and Frank Umbers. An announcement was then made, detailing all of those West Lancashire Masons who had recently received appointment or promotion in grand rank and full details of these can be viewed by following this link. Details were then provided of the changes in leadership within the Provincial groups’ system with Tony announcing the retirements and new appointments. He asked everyone to show their appreciation for the service that those retiring had given to the Province and went on to welcome the new appointees into their important and demanding roles. Full details of theses retirements and appointments can be found here. John Karran PrSGW (left) and Barry Dickinson PrJGW. Several essential items of business then followed, culminating with the welcome and very well received news that the dues for the present year would not be increased. There then followed a collection for the MCF 2021 Festival which raised a very impressive total of £5,334. It was later announced that the Mark Masons of West Lancashire had made a truly outstanding and generous donation to the Festival of £5,000. 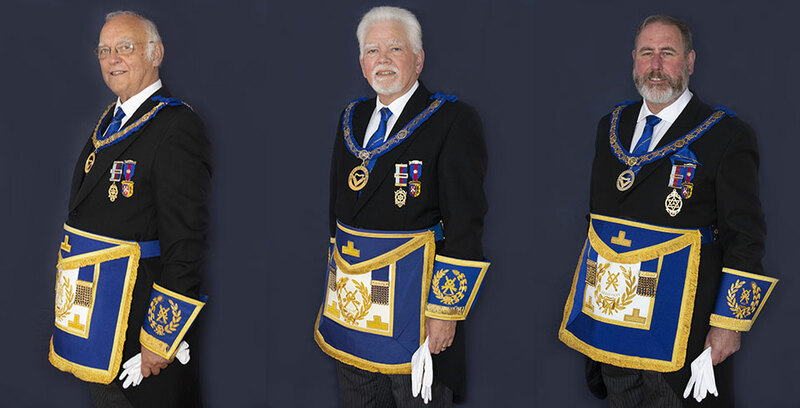 Tony expressed very grateful thanks to the PrGM of the Mark Degree Keith Beardmore who was present at the meeting. Appointments to acting rank were then carried out, led by the investiture of John Karran and Barry Dickinson as Provincial Senior Warden and Provincial Junior Warden respectively. In total, 357 appointments and promotions were made with, as is now normal practise, the PrGM taking a break in the middle of this item of business in order to deliver his annual address. The topics within Tony’s address were both wide ranging and informative with a number of current initiatives and topics expanded upon. In his closing remarks he stressed how much pleasure he derived from seeing so many brethren joining him at the meeting and sincerely thanked them for their wonderful support. The full text of his address can be viewed via this link. Prior to closure of the meeting, it was announced that the next meeting would be held at the Winter Gardens, Blackpool on the earlier date of Wednesday 03 April 2019. Deep discussions taking place at the top table. The celebrants banquet this year was held in the Spanish Suite due to the late, unavailability of the Empress Ballroom. This smaller venue presented some logistical problems with the more generous description from some diners ranging from ‘snug’ to ‘cosy’. The convivial atmosphere and celebratory atmosphere were however in no way diminished and a very enjoyable evening ensued. The members of Quingenti Lodge who ‘stewarded’ at the banquet. All the traditions were observed, including wine service by the stewards of Quingenti Lodge No 8516, who were once again honoured by the PrGM taking wine with them. The speeches continued and were brought to a conclusion by the newly appointed Provincial Senior Warden responding to the ‘toast to the celebrants’. For many it had been a long and tiring day but undoubtedly, they returned home to their loved ones and well- earned rest with a more, sprightly spring in their Masonic step! Happy faces at the celebrations.